For a week without much action, there was a whole lot of movement in the projected bracket this week. While there wasn't much movement at the top of the field, sixteen bubble teams traded places, with 8 moving in and 8 dropping out. The biggest mover this week was Boise State, who went from being out of the field to a strong contender for a Tournament bid with wins over Hawaii and South Carolina and a near-win against Iowa State. 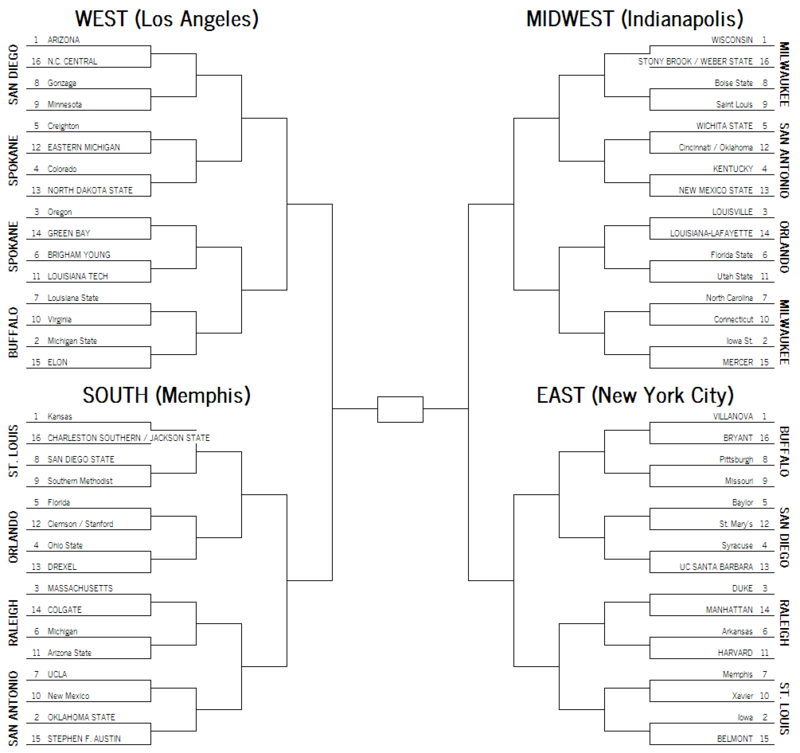 This week, 26 teams are considered Tournament locks or near-locks, down from 27 a week ago. Gonzaga and St. Mary's both fell back into bubble territory, while LSU was upgraded to near-lock status. The bubble this week consists of 45 teams, with 7 teams downgraded to long shot status and just two moving from the long-shot group back onto the bubble. 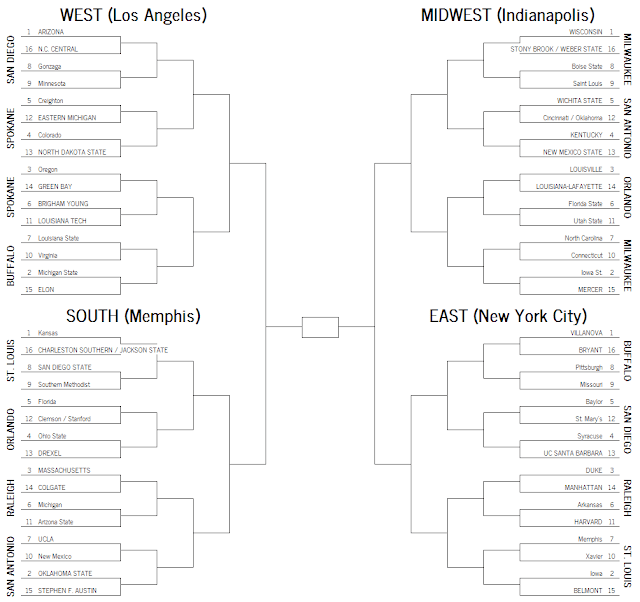 The first six teams left out of this week's field are Butler, Texas, Tennessee, Marquette, VCU, and Georgetown. UConn followed up a home loss to Stanford with a double-digit win over Washington in Seattle and moved back into the projected field of 68. It was a tough week for the A-10 bubble. Dayton dropped a home game to a USC team they should've beaten by double digits, while TAPE lost a lot of confidence in George Washington after they were only able to beat UMBC by 13 points instead of the 30 they were projected to win by. Both the Flyers and Colonials dropped out of this week's projected field. On the good side, though, VCU looked more like the VCU team everyone expected to see this year in a rout of Virginia Tech. Florida State is awfully close to earning lock status after handing UMass its first loss over the weekend. Barring a loss to Charleston Southern on Monday, the Seminoles have themselves in a position to earn an NCAA bid with a .500 or better record in ACC play. Maryland's home loss to Boston University dropped the Terps below the 2% threshold for inclusion in the bubble watch. With five losses in the non-conference portion of the schedule, Maryland now likely needs to get to win 13 of their remaining 20 games to earn an NCAA bid. Texas and Oklahoma are both hovering near the cut-line, and this week TAPE gives the slight edge to Oklahoma for a bid, with Texas being the second team out. It's just as easy to see the Big East getting six bids as it is to see the conference only getting 3. Princeton got a great win against Pacific last Friday night in Las Vegas, and for about 22 hours it looked like the Ivy League had a really good shot at two bids. Then the Tigers went out and lost to Portland and the chances all but dried up. The only way the Ivy gets two bids now is if Princeton and Harvard finish as Ivy co-champions at 12-2 or 13-1 and Princeton wins the playoff. It was a good week for the MAC, with Ohio winning at Richmond, Eastern Michigan winning at Oakland, and Toledo staying unbeaten with a win over Cleveland State. The MAC's only realistic shot at getting an at-large bid is for Eastern Michigan to beat one of Syracuse or Duke this week, though. Boise State's TAPE rank jumped 26 spots from #58 to #32 after the Broncos' showing at the Diamond Head Classic. If Tennessee and Alabama were in any of the other power conferences, their chances of accumulating enough wins to earn at-large bids would be virtually zero at this point, but the SEC is so weak that both teams still have plenty of opportunity to rack enough victories to go dancing. A week ago, Gonzaga and St. Mary's were both rated as near locks for the field. Gonzaga's loss to a mediocre Kansas State team won't keep them out of the Dance, but it was enough to downgrade them from near-lock status to the strong side of the bubble. St. Mary's horrible oh-fer in Honolulu, though, may well land the Gaels in the NIT. By the numbers, St. Mary's is still in the field this week, but history has shown that the Committee is generally fine with keeping a deserving St. Mary's team out of the field. The Gaels probably need to go 14-4--maybe even 15-3--in WCC play to lock up a bid.